No skincare product lives and dies by a single ingredient. Even a boatload of great-sounding ingredients sometimes isn’t enough. Effectiveness depends on so many factors in the overall formulation, which is something I have to remind myself of every time I go starry-eyed over some exciting star ingredient or nice-looking ingredients list. Luckily for my wallet, the starry-eyed phase of my relationship with astaxanthin ended pretty early on, thanks to CHICA Y CHICO Astazet 4.0. IT’S A TRAP! At least it was for me when I first heard about the supposed wonders of astaxanthin. Purpose: CHICA Y CHICO Astazet 4.0 is a lightening cream intended for use both on the whole face and on dark spots caused by acne or sun damage. Do not use if: You are sensitive to the olive oil derivatives cetearyl olivate or sorbitan olivate, fatty alcohols like cetyl alcohol, the coconut oil derivative caprylic/capric triglyceride, or anything else in the ingredients list. When and how to use: Use as you would a light moisturizing cream. Apply more to dark spots and reapply to dark spots frequently as directed on product packaging. It’s a different aesthetic than what I go for, but it sounded promising and it was on sale. Notable ingredients: Seriously, would you look at those ingredients? All manner of ferments, niacinamide, astaxanthin (4% “Astaxanthin-W” actually), and some excellent moisturizing and occlusive ingredients–if nothing else, this product sounds like a pretty decent moisturizer. Since I got it on sale for $14, I figured I had little to lose. One thing that did make me scratch my head a little bit was the specification of “Astaxanthin-W.” Astaxanthin-W sounds a lot like the “Retinolin Q” in CHICA Y CHICO’s Retinolin 3.0 product. 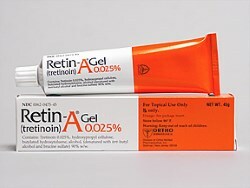 A Redditor’s digging uncovered the fact that while Retinolin 3.0 contains 3% of “Retinolin Q,” Retinolin Q is a proprietary complex and the product as a whole actually contains just 1% retinol (which is perfectly acceptable, just lower than what the name of the product and its marketing implies). I’m guessing that “Astaxanthin-W” is also a complex and that the actual percentage of astaxanthin in the product is lower than 4%. With that being said, astaxanthin can’t really be used in high concentrations in pure form anyway, since it will dye whatever it touches bright red. Still, I do want to put it out there that these fuzzy numbers leave a bad taste in my mouth. Certain active ingredients require specific concentrations to be effective. Disclosure of those concentrations on product labeling is generally either required by law or a show of good faith from the brand. #Receipts, if you will. Fudging things by hiding the actual concentration of active within a complex (that isn’t required by Korean regulations to be listed as such) just feels shady. You could argue that the rampant use of extracts itself is shady, since any given extract could have only the tiniest amount of the actual substance, but at least extracts are listed as extracts. Anyway. The proof is in the results, right? Okay, but before we get right down to performance, a couple more words on the power of first impressions. 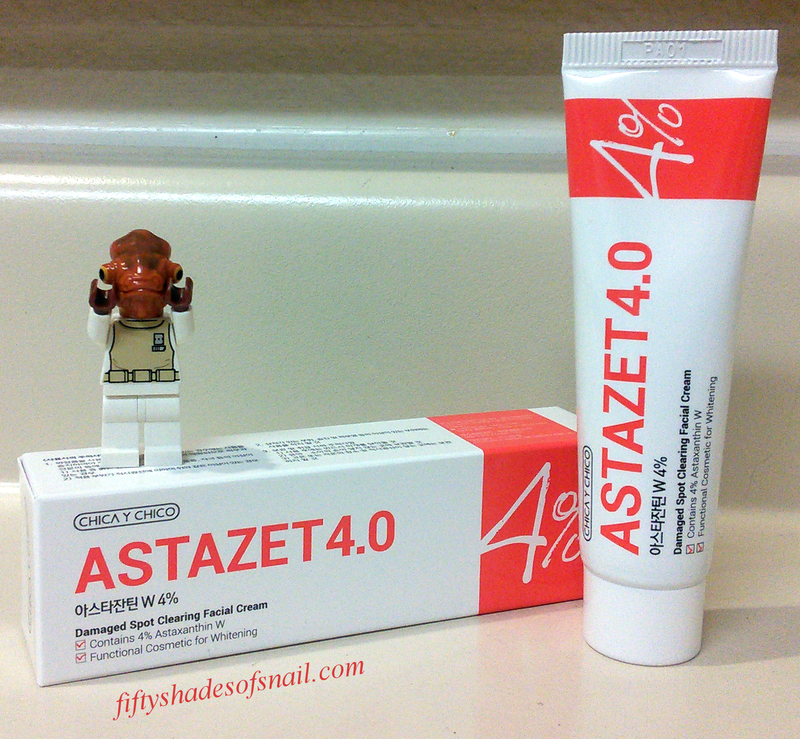 Like the rest of the CHICA Y CHICO products, Astazet 4.0 comes, as you’ve seen, in plain and clinical-looking packaging that bears more than a passing resemblance to certain prescription-strength topical treatments. The simple foil safety seal under the cap adds to the general plain, clean, and clinical impression. I’m not complaining about the safety seal itself, just to be clear. I approve of that. 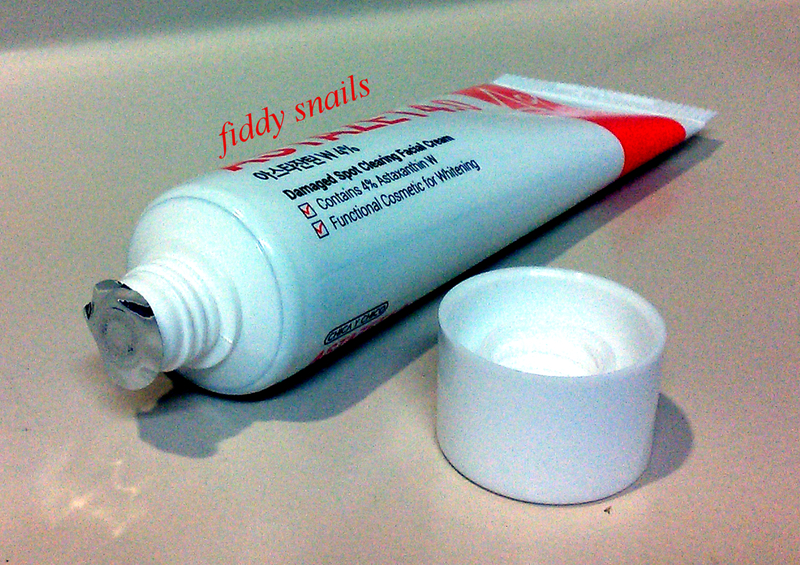 Overall, the combination of the packaging aesthetic and the specification of the “percentage” of the “active ingredient” in the product seem clearly designed to mimic prescription-strength topicals, the kind that are regulated as drugs not cosmetics and therefore held to a far higher and stricter standard of effectiveness than your average everyday nice-smelling cream in a pretty jar. That kind of association can be powerful. And it can also be misleading when the product itself isn’t quite as powerful. I first tried Astazet 4.0 out in sample form, with seven sample sachets (Wishtrend tends to give out the same samples all the time, so I had a little stash) decanted into a little travel jar, used as a spot treatment on face and to moisturize my neck in the evening and as an allover moisturizer in the morning. The stuff ran out after five days. Far too soon for me to see any results, but the product was inoffensive enough (and promising enough, on paper at least) for me to buy a full-sized tube and carry on testing it. Man, I would love to have slightly less veiny hands. CHICA Y CHICO Astazet 4.0 is a smooth, nondescript yellowish cream of medium density. It spreads easily, absorbs quickly on bare skin, and works as a light moisturizer–enough for oily or normal skin but not enough for dry or dehydrated skin, in my opinion. The slightly musty, slightly medicinal smell of the product didn’t usually bother me, though I did sometimes find it a little unpleasant. Astazet 4.0 is marketed as a lightening cream, and one of the things I hoped it would do was lighten up my neck a little bit so that I could lose that eagle face look that comes from being a little less thorough with neck sunscreen than with face sunscreen. I also wanted to see if it could do anything to the persistent sunspots on my cheeks. After a few weeks of use, I wasn’t at all sure I was seeing any change. Sometimes I’d think my spots had softened up or that my neck was looking a little closer in tone to my face, but at other times, I’d doubt myself. (Lesson learned: take progress pictures.) In order to clear up my doubts, I started isolation testing the product on the top of my left foot, where I could compare any changes to the flip flop lines there with the untreated but equally tanned right foot. At the same time, of course, I kept using the product on my face and neck the same way I had been all along. A few more weeks later, I’d finished up the tube and was finally able to come to a conclusion. My conclusion, after all the waffling and all that time, was that CHICA Y CHICO Astazet 4.0 hadn’t done anything notable for my skin tone or my sunspots at all. 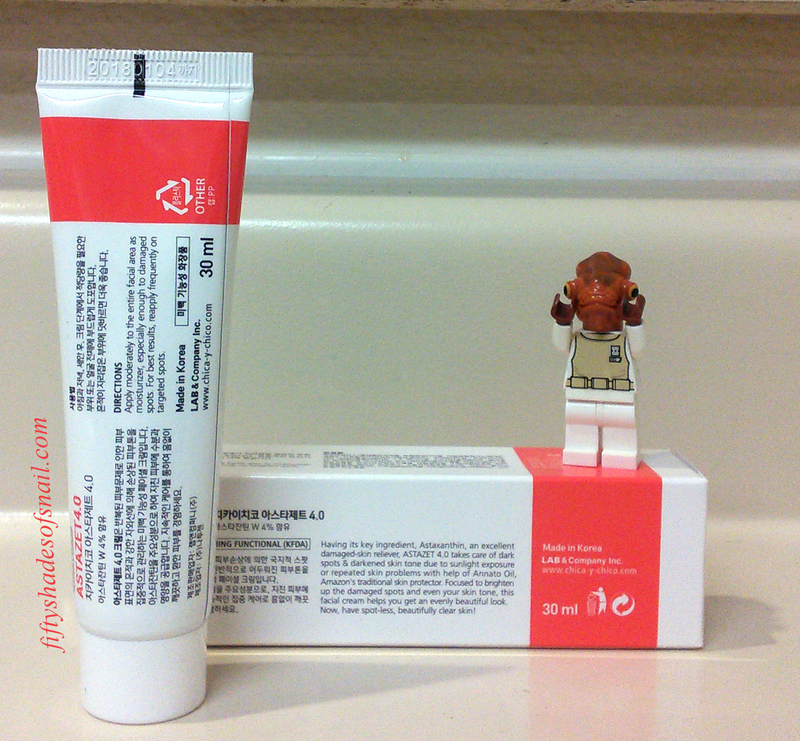 It also hadn’t done anything to a spot of PIH on my chin that I picked up from a little product breakout there. I still had an eagle face, my sunspots hadn’t faded any faster than they had been before I introduced this product, and the tan lines on my left foot were still just as defined as the ones on my right. Conclusion: If you’re looking for an unfragranced and completely unremarkable moisturizer that pretends to be a powerful treatment and contains some ferments, antioxidants, and other nice-on-paper ingredients, then I suppose 30ml of Astazet 4.0 might do. If my experience is any indication, however, don’t expect it to do anything significant for your pigmentation issues. I originally wanted to give this product a 2/5, since it’s ineffective but not actively terrible. The more I think about it, though, the more upset I feel at the way this product is packaged and marketed. I normally don’t even pay attention to marketing claims, as I mentioned in my last review. But there’s a difference between slapping some vague buzzwords on a pretty label to sell an average product, and dressing up an average product specifically to look like a potent prescription treatment. Not to mention the fudgery with astaxanthin, Astaxanthin W, and the given and implied percentages. All of that takes this product a little too close to outright deception. I find that really, really troubling. I do not support the way this product is presented and I don’t recommend it. What’s the most deceptive skincare product you’ve used? Oh dang, I was really looking forward to getting this because I really wanted a targeted spot treatment for lightening up some acne scars and dark spots, but I’m also glad that I didn’t now! Fiddy, what other products would you recommend for lightening up those dark spots and evening out skin tone? The most effective things I’ve found have been vitamin C serum (C20 and C21.5 worked equally well for this IME), Shark Sauce, and Curology. And I’ve found (upcoming review spoiler) that the Mizon AHA is a bit drying/unpleasant to use full face but works great as a 2x/day spot treatment on pimples to purge them out faster and reduce PIH faster! Well damn. It went from, ‘that’s a shame’ to, ‘well that’s just a box of seasoned farts’. I wonder if anyone has had positive response to it? The ingredients really look promising. I’m glad it was helpful to you! And speaking of the same Wishtrend samples over and over, have you tried out Red Serum yet? I have so many of those that I think I’m going to have to decant and use soon. Just got a sample of Astazet 4.0 and read your review about it. I will try it and test it. Your review is highly informative and insightful, by the way. Thanks. !